Professor Bouchard (right) listens intently as Professor Durham (left) discusses his perspective on science and truth. 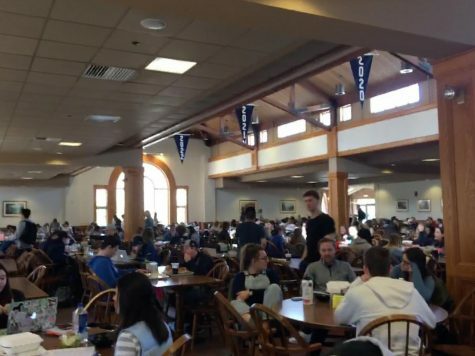 Once a week, thinkers from all around campus can be found gathering together to discuss the toughest, most thought-provoking questions. Hosted by the Gregory J. Grappone Humanities Institute, these discussions are led by a different member of the Saint Anselm community each week. These conversations, known as Come Friday Forums, include a range of participants such as students, faculty, and members of the monastic community. 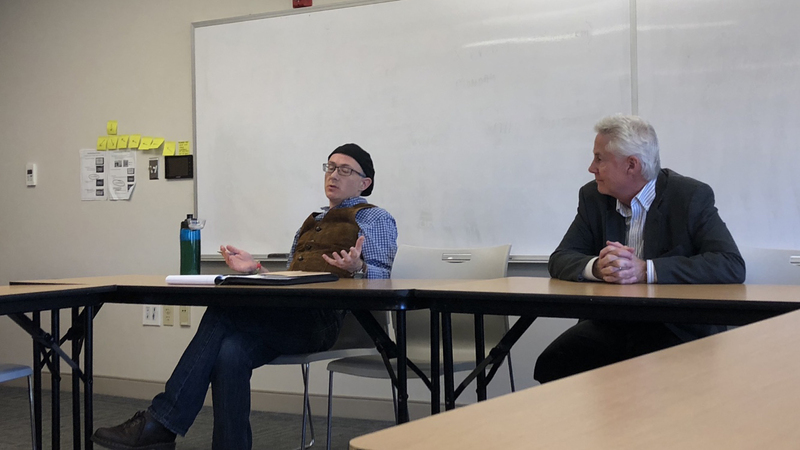 The discussion was led by Professor Ian Durham, a member of the Physics Department, and an audience gathered at 12:30 p.m. in the LLC Main Meeting Room to hear this exchange of views. While Eddington was a man of many fields, he was – most prevalently to the discussion – a philosopher of science. Being such a broad subject, it can be hard to nail down exactly what “science” entails, but Professor Durham requests that the audience keep Eddington’s description in mind. The topic gradually moves to the expected considerations. Science cannot fully explain why someone may find a work of art beautiful. Science cannot prove or disprove beyond doubt the existence of God. Science cannot even prove one’s existence is completely as they perceive it to be. The implication here is that science has restrictions by its very nature of being a human endeavor. Humans are not omniscient, and not everything can be answered using empirical evidence. That fact is certainly not to say science is purposeless. For every question that science cannot answer, there are many more that science can answer. This detour clarifies that the intention of the discussion is not to tear down science. Rather, the aim is to explore the capabilities and limitations of science in a vast, sometimes confusing world. To this, Professor Joseph Spoerl questions why he would limit knowledge to this capacity. At the end of the day, science may not be able to answer all our questions, but one could argue that all fields of study have certain restrictions. It is only through a combination of these different studies that mankind may gain a better understanding of the world. This discussion will be led by Professor Kathleen Flannery of the Psychology Department on Oct 26. The following week’s question is: “Why did Frankenstein affect everything after Frankenstein?” This topic will be facilitated by Professor Meg Cronin of the English Department on Nov 2.